Q: I would like to build a backyard pond. What do I need to know? A: Are you dreaming of summertime landscaping projects? Yep, we are too. With the cold season upon us, there’s nothing like some backyard pond planning to warm up those chilly days and get excited about diving in to your favorite hobby. First of all, consider what kind of money you want to spend and develop a project budget. In most cases, the larger the water feature, the more expensive it will cost—but some of those top-of-the-line accessories for smaller features can cost quite a bit, too. If you need some help, call a pond-building professional in your area who can assess your needs and determine your budget. Next, take a close look at your landscape and plan to position your pond on a high spot rather than a low spot. It might seem logical to locate your water feature in a valley, but it’s actually better to situate it on higher ground. This will prevent rainwater from running into your pond, which can cause water clarity and algae growth problems later on. Who will be enjoying your water feature? When planning your backyard pond, keep your audience in mind. Does it need to be kid friendly or a peaceful getaway? Pondless waterfalls are great for people on the go. If, however, you and your family have a passion for aquatic plants or fish, it would make sense to go with a traditional pond. For a large waterfall with big sound: The RapidFlo Ecosystem Pond Kit is ideal for those who want a large waterfall or stream, lots of sound to drown out nearby noise, and a system with the capacity to deal with heavy debris from nearby trees. For fish lovers: The AllClear Ecosystem Pond Kit is designed for hobbyists who want their pond to be all about their fish, not a waterfall. It works well in yards with full sun exposure and few falling leaves. For easy maintenance: The Cascading Falls Pondless Pond Kit is perfect for busy people who want to enjoy the sights and sounds of running water but have little time to maintain a traditional water feature. It’s also well suited for small yards or families with children. The most important thing to know about planning a pond of your dreams is that you should have a great time doing it. You’ll enjoy this backyard feature for years, so do your research, think through these points, and spend time designing something that you’ll love! 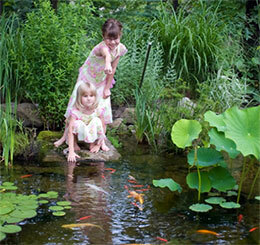 Pond Talk: When you built your first pond or water feature, what inspired your design?